9.45 a.m., Morning Prayer, Castletown Church, Kilcornan, Co Limerick. Readings: I Samuel 16: 1-13; Psalm 23; Ephesians 5: 8-14; John 9: 1-41. In the name of + the Father, Son and Holy Spirit, Amen. In recent weeks, we have had Gospel stories about water being turned into wine at a wedding in Cana, and Christ sharing water with a Samaritan woman at a well in Sychar. We have more water in this morning’s Gospel story, which brings us to Jerusalem and the pool of Siloam. 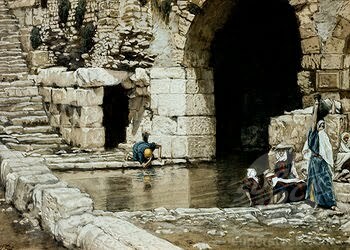 As a fresh water reservoir outside the walls of the Old City, the Pool of Siloam was a major gathering place for pilgrims to Jerusalem, and the water from the pool was used for purification rituals in the Temple during the Feast of Tabernacles or Succoth. At that time, everyone – and not just the Pharisees – seems to have believed that visible physical or intellectual disabilities, such as blindness, being lame or suffering with leprosy, were the natural and just consequences for the sins of the past, even the sins of past generations. In some way, people thought, we could explain the inexplicable way God allows other people to suffer is because of their sins or the sins of their ancestors. Today, we probably think this is superstition, a difficult way of thinking about a loving God and about people with disabilities, and an uncharitable way of ignoring the plight of parents. But, I wonder, do we still behave like that in Irish society today? How many mothers today, listening to this morning’s Gospel story on this Mothering Sunday, when they hear again about this man who was blind from birth, will think of their own children, including adult children, with life-long physical or intellectual disabilities? How many mothers, on this Mothering Sunday, will identify with the mother of this man, know how she suffers social stigmatisation in society, and recall those times when their child has left the parents being judged, being stigmatised, and being left on their own to cope? We can look benignly at a mother pushing her child in a wheelchair, or look with a caring dismissive glance at a mother embarrassed by a child who appears to be misbehaving in the supermarket aisle. But how many mothers in such situations silently bear their grief? How many mothers in situations like this bite their lips and do not know how to cope when others tell them their child is not a burden but a blessing, that God only gives us burdens that our shoulders are broad enough to bear? How many mothers, who grieve through the life of a child like this, have their grief made more difficult when that child dies and they are told, ‘Well this must be a relief to you,’ or ‘God has another angel in heaven’? In this morning’s Gospel story, Christ rejects the idea that the suffering of children is a reflection of the sins of their parents or of their families in the past. But the story reaches its climax when we are told that spiritual blindness is a greater affliction than physical blindness, and that seeing the way but not following it is worse than not seeing the way at all. Christ tells us at the beginning of this reading to be prepared to link this man’s congenital blindness to the revelation of God’s works. And once again he speaks of himself as the light of the world. 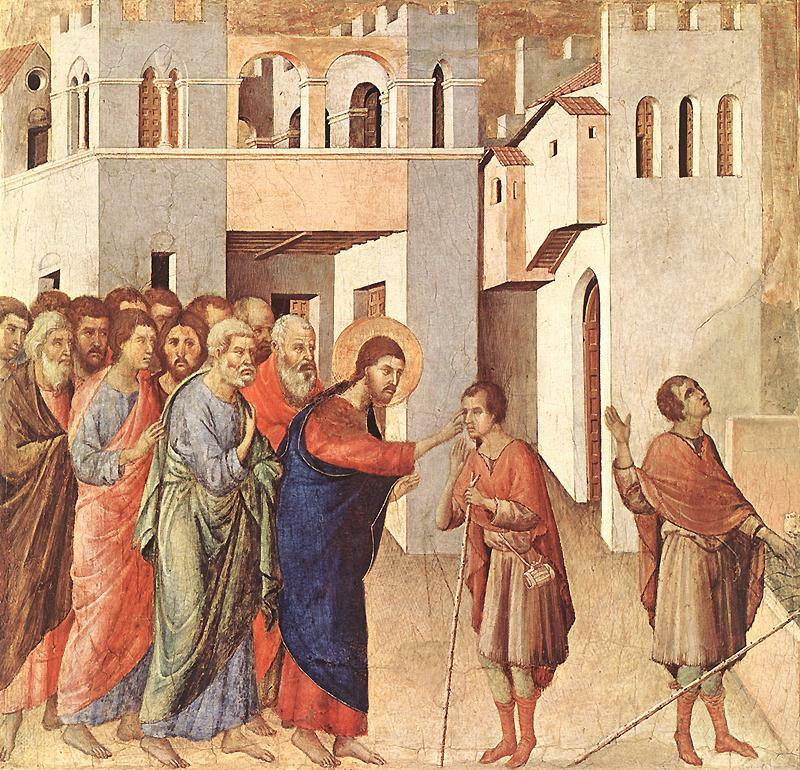 Did you notice how the man in this morning’s Gospel story does not ask for healing? It is Christ who sees him; it is impossible for him to see Christ, and so he does not ask Christ for healing. Nor does Christ ask him what he wants. This is an act of pure compassion, not just for the man because of his physical disability, but it is stirred too by the social judgment that has been passed on him. Christ sees the man, not because of his blindness and the supposed sins of his parents, but sees him first as a child of God. He has not been asked to return, but like the one Samaritan among the Ten Lepers, he does come back. Yet by the time the man gets back, Jesus is gone. What are the consequences of the healing? The man moves from being blind to having sight, from being a beggar to being free, from being dependent to being independent, from being regarded as a sinner to knowing that he is free of the sins that others have laid on his shoulders. Yet he is still reviled and driven out, cast out. In his first condition, people thought he suffered as a consequence of God’s judgment on him and his past. Now he truly suffers because of what God has done for him. But his suffering in both cases only exists because society rejects him. Yet no-one believes him, and so his parents are called. They too are not believed, so the man is called in for interrogation a second time. Think how, at the end of this Gospel, Thomas refuses at Easter to believe in what he hears until he sees for himself. 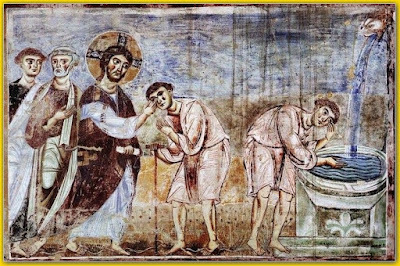 Notice too how Christ puts the poultice of saliva and mud on the man’s eyes on the Sabbath, when new life is about to begin and healing actually takes place. The blind man’s eyes are opened on the Sabbath itself, before the new week, before a new life, before what is for him almost a Resurrection. How many mothers hearing this passage on Mothering Sunday would identify with the parents and their embarrassment, and have so often heard the judgmental responses we hear in this reading? How many mothers on hearing this passage can identify with a mother who suffers when a child has disabilities, and may even continue to suffer when their child is healed? In the last century, one set of the circumstances that excused society as mothers were rejected and their children were stigmatised is in the way the ‘Mother and Baby Homes’ were run. Let us not ask how a child was conceived. That compounds and perpetuates society’s judgmentalism. Many of these children were conceived in love, no matter how young or how unacceptable it was in those days. Other children were conceived through violence or abuse, often at home, but the mother shouldered the blame. Almost all mothers loved those children, and most mothers, it seems, wanted to keep those children. But no-one was offered a choice. And for ever after, both mother and child were stigmatised, told that the children were the consequences of sin. It was an easy way out for society. But even then the rejection was compounded in some, in many, cases when the children were treated as burdensome, disposable commodities, to be exported, to be given away as cheap labour, or to be buried without the dignity of recognising that they too were made in the image and likeness of God, that they too were deserving of love and could respond with love. How many mothers on this Mothering Sunday, distressed by recent reports of the Tuam Mothers and Babies horror, and similar stories throughout Ireland in recent weeks, would compare the response they received from religious figures in the past with the voices of religious authority in this Gospel passage? In the weeks leading up to this Mothering Sunday, the Church and State, Mother Church and Mother Ireland, have been found falling short of the demands of the Gospel. We failed to see those mothers and those children as Christ sees them. It was the Church, and it was Society, that were blind, that showed blind prejudice, in perpetuating the myth that the children should suffer for what society judges to be the sins of the parents. For whenever we deny the love of God, and refuse to love one another, no matter how conceived or who has conceived, if we deny the love of God and we refuse to love one another, then we deny the very core message of Christianity. + the Father, the Son, and the Holy Spirit, be among you and remain with you always. Amen. (Revd Canon Professor) Patrick Comerford is Priest-in-Charge, the Rathkeale and Kilnaughtin Group; of Parishes, and Lecturer in Anglicanism, Liturgy and Church History, the Church of Ireland Theological Institute. This sermon was prepared for Morning Prayer in Castletown Church, Kilcornan, Co Limerick, on Sunday 26 March 2017.